New clothes and a holiday party next Wednesday! 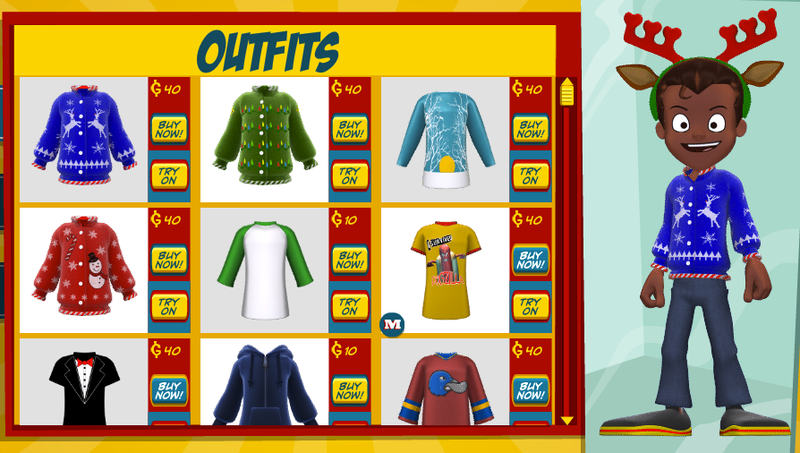 Deck your avatar with awe-some cloooothes, fa la la la, la la la! It’s the holiday season, friends. And that can only mean one thing – CELEBRATIONS! Next Wednesday, December 21st we’re throwing a special holiday party. Moe Hawk has invited us to the dance club in front of HoopGood Hall at 7pm Eastern time. A sneak peek at some upcoming holiday items! We’ll be releasing some new holiday clothes just for the event, and if you wear some holiday threads to the party Moe will hook you up with some GoDough! One lucky person will even win a free membership! These holiday threads are for everyone, and we’ll be making an announcement when they’re out. Mark next Wednesday on your calendar for an evening of holiday awesomeness. Posted by fungoplay on December 16, 2011 in Cool stuff, Parties and tagged avatar, events, fungoplay, holiday clothes, holiday party, holidays, new clothes, party, updates.